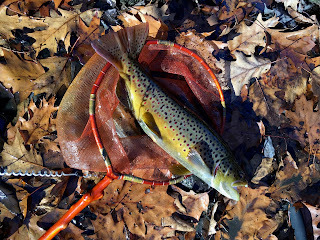 I finally had a chance to meet up with Rowan from Connecticut Fly Angler this year, and we spent a few early winter days fishing some small streams in his home state. I love fishing in CT, the brookies are beautiful and so are the surroundings. There are all sorts of little streams hidden in the rolling hills and river valleys. ...others were of the tumbling, plunging kind. Wherever we went, the landscapes were dramatic, as was the lighting. In one place, I was told the brookies were some of the most colorful around. I wasn't able to catch one there, but Rowan did. Look at those colors! There are pink spots inside the yellow ones on this little guy... that's something I haven't seen before. What incredible colors. I would like to return here one day to get another shot at catching one of these beauties myself. Water levels were a little better than they had been in previous weeks, but still looked low. In some cases the streams were just particularly small with not too much water at all, in any season. I spent most of one of the days using this little fly that I've been having some fun with recently. I've taken to calling it the ginger snap kebari on account of the color. We fished at least 3 streams the first day, and I think we actually made it to 4 on the second day. Most of the brookies were very small, although I did spook a couple of larger ones. They were hanging out in some strange places as they often do during these transition times between seasons. I certainly wasn't counting though, it was all about being in new places and having that wonderful feeling of exploration running through my veins. Of course the fish we did catch were all beautiful and wild. Some leaves were hanging on to the trees and caught the light of the setting sun so perfectly, it looked as if the forest was on fire. I spent a little too much time watching and observing, and a little bit too little time fishing, but sometimes that's what this is all about. I feel like a broken record talking about our low water situation in the Northeast, so of course after a nice solid 2 day rain event, I scheduled a day in brook trout forest. I drove to New Jersey because I have a nice list of streams to fish over there, and the season is open while NY is closed. I walked down to the stream and found decent water levels and a beautiful small gorge. Immediately I was ecstatic to discover that the brookies were still in full fall dress and that they had survived a few months of low water and warm air temps. This particular stream had some nice elevation change and some really ideal plunges that held beautiful wild brook trout. Working my way carefully upstream, I was sure to avoid casting a shadow and tried my best not to spook the trout in this pristine little brook. This stream was very small, I fished it to where it was essentially a tributary of a tributary, and the fish were mostly in little hidden pools and deep slots cut into the rock by erosion and water. I kept my eyes open for redds but I only saw one with a remaining pair of trout, which of course, I left alone. This beautiful male was an impressive fighter, and I released him quickly back to his home. Some mushrooms were growing after the recent rain, but I didn't find anything edible that I wanted to take. ... and I'm glad I did, because one of the larger fish of the day was living under the foam in a log jam pool, hidden in a mess of fallen trees and branches. I twitched this Ausable dry fly in the foam and saw a flash... tapping my rod gently with my finger, I let the vibrations disturb the surface. Soon enough the fish slowly rose to sip the fly and turned, so I set the hook and the fight was on. The vibrant and varied colors of the wild brookies in this stream impressed me so much that I forgot to take enough photos of the pools I caught them in. Soon after catching this beauty I reached the uppermost section of stream. There were no more fish hitting my fly, so I turned around and walked down to an area below where I had started my day. I discovered a popular swimming hole and a beautiful cascading section of stream. Below it, a small brookie was staking his claim in another picturesque pool. After I had checked most of the fishable sections of stream, I walked along a trail and back towards the car. The sun had been making appearances between momentary threats of intense stormy weather, and the light was dramatic, casting long shadows. This was a successful day on a really special small stream and I can't wait to return here again some day soon. Less than 2 hours later I reflected on my day while looking at the city skyline. I had miraculously dodged the traffic and made it home in record time. Late fall presented many challenges to the small stream angler... full sun, no water, and an early spawn made the brookie streams a lesser destination this fall. I spent some time hiking, and when I could get to where there was enough water, the fall browns made for a nice change of pace this year. ...and in different kinds of water. Most of the fall browns I caught this year were wild. A few were stocked, but fun to catch nonetheless. ...make for a rewarding experience. A few small streams have pools more difficult to access that still hold some water. Beautiful but skinny fall browns populate places such as these. And when the conditions are right, just after some rain, or when the water is released from a reservoir dam and flows with more vigor, the bigger fish begin to run up too. This year was good to me and I was able to get some really nice fish in places that I don't often find many. I've mostly been using variations on this kind of fly, below. And this is the original that inspired it, a gift from a friend in Japan.